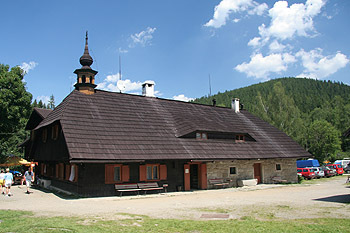 The village of Srní is located in the centre of the Šumava National Park. Accommodation is available in boarding houses, pensions, camping sites, and *** hotels offering a number of services including a swimming pool. The overall accommodation capacity is 1200 beds. The village of Srní has been made famous by novels by Karel Klostermann (V ráji šumavském In the Šumava Heaven, Kam spějí děti Where Are Our children Heading etc.) The Holy Trinity Church standing in the centre of the village was built in 1805. The Vchynicko – Tetovský canal constructed between 1799-1801 is one of the many tourist attractions in this area. The newly reconstructed bridge over the river Vydra in Rechle gives one an idea how wood was being transported down the canal. The walk along the river Vydra is wonderful, one can walk from the Antýgl campsite to Čeňkova Pila. The route is 7 km long and it is also suitable for people in wheelchairs. The Šumava countryside can be appreciated from the Klosterman view point. One can see the Vydra valley, the Antýgl Peak, the valley of the Otava River, the Křemelná Peak and if the visibility is good one can see as far as the Svatobor observation tower above Sušice. 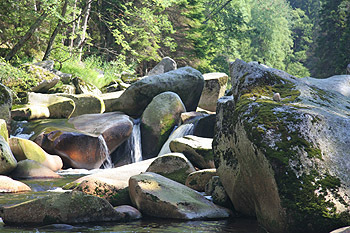 In 2006 the Šumava National Park and the Civil Association ‘Karel Klosterman – the Šumava writer’ restored the Hauswald Chapel with its spring of miraculous waters also known as Šumava Lourdes. One can follow a trail from this place round the Kostelní Peak. The trail is equipped with information boards and quotes from works by Karel Klostermann. The countryside along the canal is ideal for cycling and walking. Nearby the village there is the observation tower Poledník and if the weather is good one can see the Klínovec Peak in the Krušné Hory Mountains but also the German and Austrian Alps. Tourists to this area might also enjoy the Třízejerní Slat (The Three Lake Peat Bogs) which is one of the typical Alpine beat bogs of this area. In winter this area is ideal for cross country skiing. A so-called Srní Circular Track is maintained over the winter for cross country skiing.